I started learning Emacs last week! I’m not using it full-time just yet, for now I’m studying it own its own, and using it for small tasks while I learn the basics. I decided to keep weekly notes (using Emacs of course!) of the things I learn along the way. I started out by watching this video that shows off all the things Emacs can do. Next I read this article. 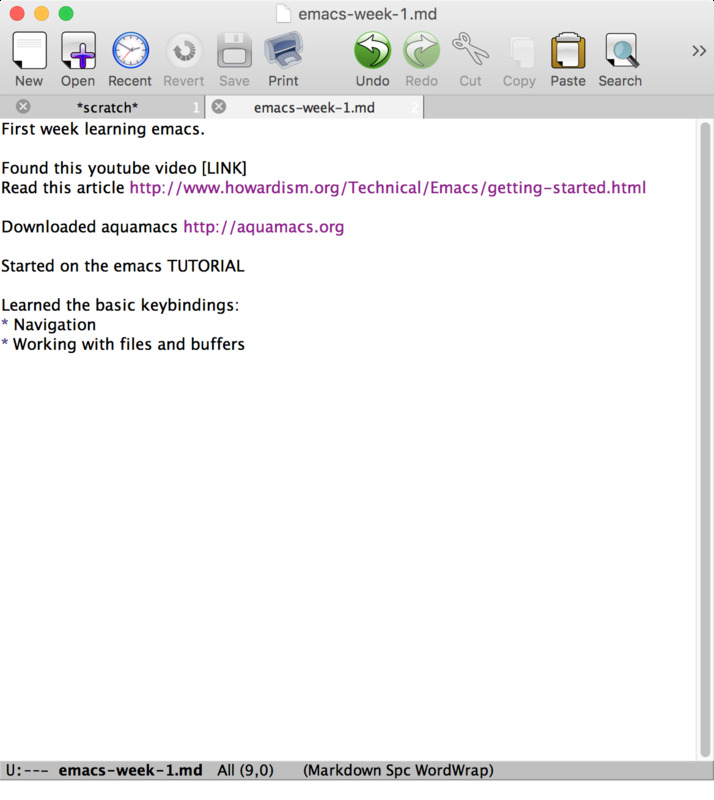 I downloaded and installed Aquamacs, based on the recommendations in the article and video. I updated my Karabiner config to remap caps-lock and return to left and right ctrl using this modifier. I read through the built-in Emacs tutorial (using C-h t). I practiced all the basic Emacs shortcuts like moving around, editing, and working with frames and buffers. I’m still pretty slow moving around and editing files, but I can remember a good bit of the shortcuts without looking now. I haven’t dug into major/minor modes much yet, but they seem really powerful. The built-in help features using C-h are really helpful when I forget a shortcut. Aquamacs supports lots of the standard macOS shortcuts, like ⌘+s and ⌘+w, which comes in handy (though I try not to use them). Nothing fancy yet. Pretty much just the out-of-box Aquamacs.